Did you know that fall is one of the best times of year to start new landscaping projects and plantings? Whether part of a more massive landscape construction project or as preparation work for springtime Rhode Island sod and seed, the more you can do now, the better. When it comes to landscaping services in Northern Rhode Island in the fall and winter months, it is important to take care of clean-up and other maintenance duties to prepare your property for warm weather and busy growing seasons. You should also do lawn fertilization in Rhode Island in the fall. In fact, there are a lot of misunderstandings about pruning, propagation, planting, and herbicides between the spring and fall seasons. That’s why it is better to work with a team of professionals who have experience working on commercial properties in New England. Companies that only work with residential customers or who have a great deal of experience working in other regions of the country won’t be able to accurately prepare your landscape construction project for a New England winter. Planting the perennials, which are the flowers that come back again year after year, should always be done in the fall. The cooler temperatures and increased precipitation can help these long-lasting, durable plants to establish valuable root systems better. While a mild winter will be even better for root growth, the plant will go dormant in extreme temperatures and then start growing again in the spring, picking up where it left off for the winter. The soil temperatures that range through mid-October are best for root development. In addition to perennials, turf grasses and bulbs that will bloom in the spring are also great for planting in the fall. Trees that are balled or burlapped will do well if planted during the fall season. Some varieties will require an early fall planting instead of a later start, so it is best to work with landscaping services in Northern Rhode Island that can provide you with insider information that will help you maximize the return on your investment. Again, it is the root growth that benefits most from a fall planting, helping the plants to grow stronger and last better in their first year. Any plants that you want to prepare for spring planting are also good candidates for growing during the winter months. This is an excellent time of year to work with landscape construction experts to start making plans and designs for the spring. It is less busy for landscape designers, providing you with a great opportunity to go over plans for your landscaping and planting in Rhode Island without having to compete for their time during a busier season. Some plants should be planted in New England during the spring, including late March, April, and May. The rainy season can help them to get a headstart on summer. However, if the property has issues with poor drainage or if the rainy season is too long and too wet, it can cause damage to vulnerable plant species. This is another significant benefit of consulting with a professional landscaping design expert who can provide you with advice that can help your property to look it’s very best. Everything from sod and seed, seasonal plantings, pruning, and trimming, to lawn fertilization in Rhode Island can be professionally managed and maintained with services from Eastern Landscaping, Inc. If you are interested in designing a landscaping construction project for your commercial property, you can speak with one of our experienced designers to schedule an appointment for a consultation. Our team can take your ideas and turn them into a reality, providing suggestions and workarounds for ideas that are not appropriate for your location or the time of year. Certain factors, including drainage, sun exposure, and local weather conditions, can positively affect or negatively impact some landscaping and planting in Rhode Island. Eastern Landscaping, Inc. has many years of experience working with landscaping services in Northern Rhode Island and Southeastern Massachusetts. Whether you require Rhode Island sod and seed services or a brand new landscaping design for your office building, shopping center, or municipal property, our team can help you find a cost-effective and attention-getting solution. The goal is to use landscaping services to your advantage, helping to increase the value of the property and make it more welcoming and professional looking to customers, tenants, employees, clients, and other passersby. Call our team at 401-766-9035 and schedule an appointment for a NO COST estimate for your next commercial landscape construction and maintenance project. 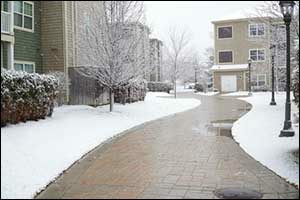 Start making plans today so you can enjoy a better-looking property when all that snow melts again in the spring.